Harborough District Council Leadership Development Programme. Initially invited to bid for a short intensive programme of support for the Senior Management Team, Janet Dean introduced The Open Channel to Harborough District Council in July 2011. Our involvement has lasted for a year during which the organisation has faced one of the most transformational periods in its history. An initial programme of support for a Senior Management Team facing change, we provided three themed workshops, three Action Learning Sets and telephone and Skype coaching for the Chief Executive and six senior staff. In phase two we were commissioned to provide a programme for up to 30 senior staff including the Senior Management Team. Based on five of the ten Harborough Leadership Competencies we delivered one day interactive workshops on Managing Change, Leadership, Working with Others and Communication and Strategic Focus. Between the workshops we facilitated four Action Learning Sets linked to each of the themes, enabling participants to bring practical issues from the workshop to a shared problem solving arena. Phase three, which uses Appreciative Inquiry techniques to explore leadership themes is focused on the new Leadership team. "I felt it gave a common language and a platform from which to challenge (appropriately) others when behaviours could have been better." "The Action Learning Sets were the most positive outcome for me and I intend to continue to commit to them." "It introduced me to new concepts with regards to leadership – and I found the appreciative enquiry element particularly interesting." "I feel more confident in my leadership style and the impact I have on those around me." "I found working with others especially useful and I feel now that I have a much better working relationship with colleagues and will be in better position to share issues and problems." Supporting a Housing Professional to re-launch her career. Following redundancy from the role of Chief Executive of a small housing charity, this housing professional had spent two years in a role which was failing to use the range of her skills and she wanted to re-launch her career. After completing a series of three two-hour coaching sessions which focused on helping her to identify what she really wanted from her next role, and the skills and experience she could offer, the client was offered the role of Director of Housing Services in a large regional organisation. Her new employer agreed to fund a further programme of six sessions over the course of her first year which helped her to grow in confidence and to make an immediate impact in her new role. Whilst working as Strategic Adviser for a regional membership body, Janet Dean was asked to provide outplacement support for a housing policy expert taking voluntary severance. The support consisted of four face to face session as well as email and telephone support over a three month period. During the course of the relationship, Janet helped the client to identify her preferred career option and supported her in developing a new business. Sessions covered practical aspects of establishing a company, networking, marketing and contracting with clients. Following restructuring in a large Unitary Council, this Regeneration Director was unsuccessful in competing for a new post. Janet Dean was appointed to provide outplacement support to enable the client to identify future career options. In just two face to face sessions, Janet helped the client to identify her key skills and to develop strategies for achieving employment which would be compatible with continuing family responsibilities. The support Janet gave included CV review, support for job search and networking and preparation for application and interview. In January 2014 Dean Knight were appointed by the Joseph Rowntree Foundation as Project Manager for a fifteen month evaluation of York and Bradford Dementia Friendly Communities Programmes. The work will be delivered through a collaboration with Qa Research and AESOP. The project involves structured face to face and telephone interviews and an online questionnaire for people with dementia, their carers, professionals, volunteers and project staff working across both cities. Most of the fieldwork will be completed between June and September 2014. We plan to produce interim findings by November and our report will be published in April 2015. The project team found many innovations and bright ideas including guided walks and cycle rides around York, adapted games and leisure activities, helpful service in shops and supermarkets, and training for British Transport Police in supporting people with dementia who lose their way. The team made further proposals which could make York more dementia friendly, such as drawing on the tourism capacity of the city and making dementia a priority in health and social care reform. The central messages f the report will be that people with dementia need to be included in, not excluded from communities; that what they can do is as, if not more, important than what they can't do; and that what is good for people with dementia – patience, kindness and consideration – is good for us all. Janet Dean has also worked with Innovations in Dementia on the LGA-funded project to produce a toolkit for Local Authorities on how to promote Dementia Friendly Communities. She supported work in Sheffield to pilot the concept of Dementia Friendly Communities in the Shiregreen area. This helped to bring together a wide range of people working in the area who support or are in regular contact with people with dementia. Janet helped Sheffield Council produce an action plan which will guide their work across council departments and with partners agencies for the coming year. Janet worked with city planners and the access officer to audit the Shiregreen Estate for its 'dementia-friendliness'. 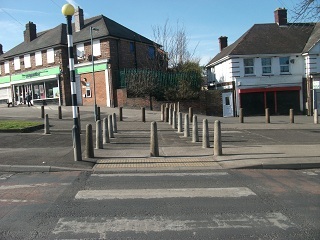 This is one of many examples of confusing streetscape caused by a lack of co-ordination between policy initiatives.